Our gallery of the most anticipated Super Sentai DX Mecha in years is finally here! 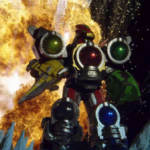 The DX Kyutama Gattai KyurenOh is made up of five individual zords, or voyagers, utilizing the DX Kyutamas as the connectivity pieces. With lights and sounds unique to anything Super Sentai has released in the past, KyurenOh dictates a change in direction for Bandai Japan which has struggled in recent years with their Super Sentai toy line. But how does it actually do? Check out our full gallery of nearly 100 images, as well as our review write-up, by clicking here or clicking “Discuss on TokuNation forums” link! 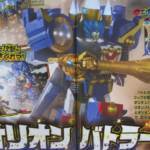 Enjoy and share your own thoughts on DX Kyutama Gattai KyurenOh! Yesterday saw the premiere of the third episode of Uchu Sentai Kyuranger. With the popularity the series is currently taking on, we’ve decided to go ahead and take a series of screen captures, primarily of the action scenes, and make them available for everyone to enjoy. Enjoy over 700 screen captures by clicking the title of the story. Talk about lucky! Please take a moment and vote on the episode by clicking here. Join in the discussion too! It was a great episode! Our final screen capture gallery for the premiere of Uchu Sentai Kyuranger is here and this one is focused strictly on KyurenOh, the Megazord of the series! Check out 250 images of the formation and battle of KyurenOh, arguably the most anticipated Megazord of Super Sentai in the last few years! Click here to look at all 250 images. Join in our episode discussion for Uchu Sentai Kyuranger‘s premiere by clicking on the discussion link. Was the hype real for you? Sound off in discussion and our episode poll! It’s time for another round of screen captures from the premiere of Uchu Sentai Kyuranger! This time we went straight to what everyone wants to see which is the action sequences! Check out the entire team battling the bad guys in 400 screen captures. Click here to see all 400 images and then join in the discussion of the episode by clicking the discussion link. Uchu Sentai Kyuranger premiered yesterday and the consensus from the Internet is that it was AWESOME! 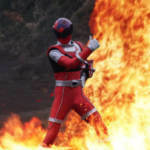 Whether or not it lives up to the hype has yet to be fully seen, but anytime you have an introduction sequence like the one Shishi Red had, you can’t help but think TOEI has pulled out all the stops on this the 41st Super Sentai. In celebration, we’ve taken a ton of screen captures – 350 to be exact, and that’s just Part 1. There’s some great shots here. Please feel free to use them as you’d like. Click here to check out all 350 screen captures. Join in the episode discussion by clicking the discussion link. wotakufighter is at it again giving us our first look at the DX Seiza Blaster from Uchu Sentai Kyuranger! With it, he also looks at the Shishi Kyutama. 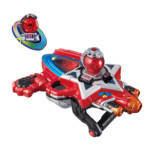 For those unfamiliar with the DX Seiza Blaster, this is the henshin/morphing device used by the Uchu Sentai Kyurangers. Check out the video below! Today is the day – the premiere of Uchu Sentai Kyuranger! Stay tuned to TokuNation.com as we look at the first episode in detail after it airs! The hype is real and we’ll be there to bring it to you!